And, Jewly Hight herself; because Hight might claim to be writing the stories of these eight women singers-songwriters and their examination of “their geographical, cultur al, familial, and religious roots in their music” but Hight’s actually written herself into the text. I want to know more about the 8 female artists and Hight. A longer book would have allowed the inclusion of more of the lyrics by these talented women but also more of Hight herself. Right by Her Roots is a love affair with these talented women singer-songwriters and it’s love-affair that just isn’t long enough. It’s all fascinating but at 200 pages, there simply isn’t enough space to really examine these issues and fully explore the back catalogues of the music of these women. I want to know more about all 8 women but equally I want to know about Hight. 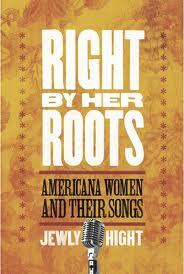 I want to know about how Hight traces her roots and I want more of Hight’s personal responses to these women. I definitely recommend this book but with fingers crossed that Hight writes more in-depth books about these women (and herself).